One issue?! Climate crisis, energy, soils, pesticides, foreign policy, tax havens, refugees, NHS, Brexit (aargh).. and, on the other side, organic farming, woods, fabulous people fighting for justice, birdsnbees, solutions everywhere if only we can grab them. Concentrate on one issue, pursue it, look for allies, share ideas and goals, have fun, realise I can't change the world on my own. Take vicarious pleasure from the success of others. We can't do it on our own. Always look for goals to share with others - friends, colleagues, family (hardest of all!) - and use other people to keep your spirits up. Mostly the fire just keeps on burning! Burn out comes for me when I can't find others to share with, and see the path ahead with. There's nothing wrong with taking a few weeks or months out; I never forget though that a stray conversation with an inspirational person can set the fire blazing again immediately! 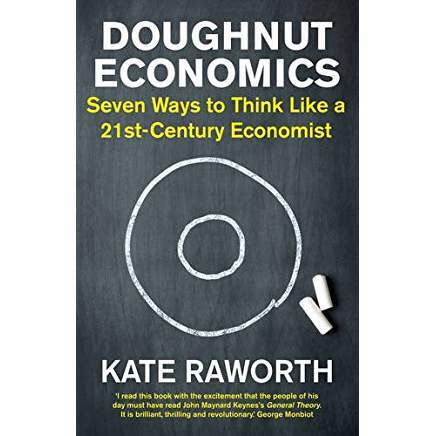 "Kate's resetting of economics is timely, accessible, thoughtful, and, most of all, at last, a fundamental challenge to the neoliberal orthodoxy. What she presents and illustrates is what we all should already know: that our popular form of economics is restrictive and isolated and completely fails to see its own limitations, or the damage it wreaks as a consequence of its manifold failures. If you're interested in the planet and our inter-reaction with it, this is essential reading. A great book."